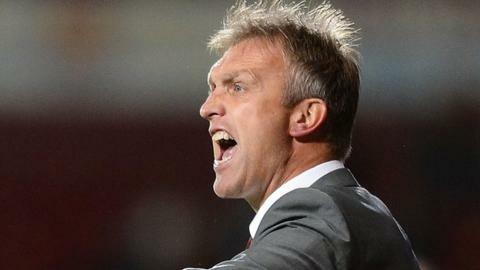 Crewe Alexandra manager Steve Davis has admitted to concerns at the amount of first-year referees to have been given control of their matches this season. Davis was left fuming after a penalty awarded by rookie ref Richard Clarke proved a turning point in Tuesday night's 2-1 home defeat by Bournemouth. "I spoke to the main referees' assessor about it," Davis told BBC Stoke. "They do send them here more than anywhere else. He did admit to that but I've asked them not to send as many." Davis admitted that Crewe's customary place up near the top of the Fair Play table actually counts against them. "I don't mind the odd one or two," he added. "Because of our fair play and the way we play, we don't give many fouls away and there are a lot less decisions to make. That's why they send them here for their baptism. "But I'd rather they didn't if they're going to perform like that. I'd rather have someone with a bit more experience for a game of this nature." It was the award of a penalty for Crewe striker Mathias Pogba's challenge on Cherries winger Matt Ritchie that so infuriated Davis. "It changed the game," said the Crewe boss. "It looked fairly innocuous. And, after he gave the penalty, he lost it. "He did not know what decisions to make, he got confused, he wasn't listening to anything that was passed on from the side from the other officials and the game was too much for him. "I'm sure the assessor will go it through it with him, but it's not going to make any difference to the result." Despite dropping to 13th, 10 points adrift of the all-important sixth place in League One, Davis is still not ruling out Crewe making the play-offs. After losing at Southend almost a year ago, the Alex were in 12th, but they then went on a 16-game unbeaten run to the end of the season to reach the League Two play-offs before winning promotion at Wembley. "As long as we keep playing like that," added Davis, "And we don't lose our concentration and we get the rub of the green from the referee, then we've still got a great chance."